A Community Together (ACT) for Education is an unprecedented initiative by our local public schools in the Monroe 1 and Monroe 2-Orleans BOCES districts, area businesses, and community members (LIKE YOU!) to share what’s GREAT about our schools. 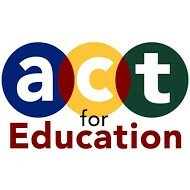 SHARE our school’s SUCCESS STORY at www.ACTforeducation.org or on Twitter @Act4Ed. Also, there are a limited number of ACT for Education lawn signs available at District Office. If you are interested in placing a lawn sign at your home or business please contact Amanda Puleo at apuleo@cccsd.org or 293-1800 extension 2300, to make arrangements to pick one up.